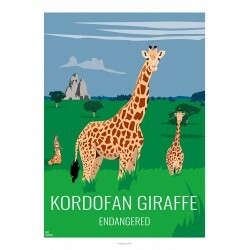 The Kordofan giraffe is present in Congo in the Garamba National Park, it is mainly hunted and killed for two reasons. The first reason is that it makes an ideal wedding gift. Indeed, once shot, Congolese poachers resell the tail several thousand euros. From now on the hairs are used to make lucky bracelets for the ladies, as can be seen on the poster to the left of the giraffe, or more simply to make rudimentary fly hunters. The second reason is less folkloric, because the Sudanese poachers essentially kill her to cut her up and resell her meat to the war refugees. Historically it is a giraffe present in many French zoos, including the zoo Vincennes, here represented in the background.